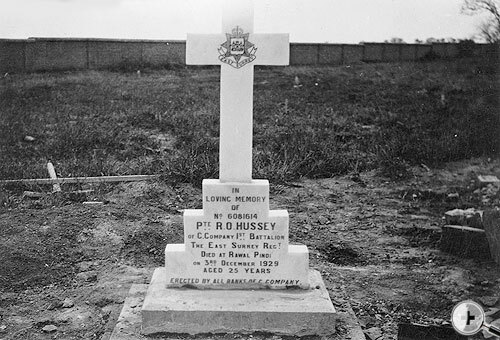 The following men of the 1/4th Bn The Queen’s (Royal West Surrey) Regiment died whilst serving in India during the First World War and are interred at Nowshera Christian Cemetery. Signaller John Streeter on 2nd October 1919 aged 34 years. Erected by the Officers, NCO’s and Men of his Battalion. Private James William Rose on 14th July 1919 aged 34 years. Erected by the Officers, NCO’s and Men of his Battalion. Private Christopher John Hawkes on 13th July 1919 aged 36 years. Erected by the Officers, NCO’s and Men of his Battalion. Private R A Nisbett who died at Nowshera on 5th September 1916 aged 23 years. Erected by the Regiment as a token of respect. Quartermaster Sergeant Harry Moulder who died at Nowshera on 20th November 1916 aged 37 years. Erected by the Regiment as a token of respect. Private Thomas Payne who died at Nowshera 24th November 1916 aged 27 years. Erected by the Regiment as a token of respect. Private A C Buckner who died at Nowshera 5th January 1917 aged 33. Erected as a token of respect. Private William Izatt who died at Nowshera on 9th July 1916 aged 24 years. (This stone has fallen).